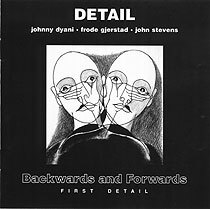 Johnny Mbizo Dyani, bass; Frode Gjerstad, tenor and soprano saxophones; John Stevens, drums. Tracks 1 and 2 previously released on LP and recorded at Staccato Studios, Stavanger, Norway on 11 October 1982; track 3 previously unreleased, recorded in 1985, no other details. Original cover artwork (front cover reproduced above) 1 2 NO 1 by John Stevens; original LP design by Fay Stevens.